Welcome to our website. We believe that the art of professional framing is as valuable as the artwork itself. Art is individual and unique and so are people. People won’t aspire to paint or buy a piece of art unless something in that work attracts their character, personality or has some emotional content. An artists paints a painting to the colour, line, intensity and mood that they visualise. Therefore if we turn the framing into a striking work of art, we are creating a distraction from the painting. Our belief is that subtlety is the art of good framing. The detail and mood of the art, and the character of the owner are vital in deciding the framing technique. Yesteryear’s skills in framing design mixed with today’s technology and knowledge of preservation yearn for a wonderful and timeless piece. It doesn’t matter what you frame, there is always a perfect frame for that piece. 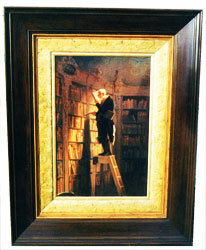 The gold embossed and polished wood frame, built around an old traditional print, won FIRST PRIZE in a national framing competition for all the framing including his fellow competitors from all over Australia worked to frame the same print but our treatment was regarded as being the most complementary to the picture. The Frame Factory has been fortunate to frame most interesting pieces – pieces of the Berlin Wall – the smallest screw in the world – a fossil replica – antique Greek jacket – oil with a black opal set in it – ivory fans and beads – wedding bouquets and thousands more…. Please come in a see us.